Bask in the glory of brimming Bikaner. This experience truly depicts the character of Bikaner in its best form. The deserts in this city radiate shine, belonging not only to the sun, but to the numerous citadels, forts and heritage hotels. Famous for the golden deserts and delectable sweets, the city is blessed with medieval grandeur and scores of mystic dunes. Proudly called the camel city, Bikaner is brilliantly known for the best camel breed in the world, the credit to which goes to Camel Research and Breeding farm. A formidable part of desert triangle in the country, Bikaner Tour is a regal experience of a lifetime. Junagarh - Junagarh Fort in Bikaner is an impregnable territory laced by moats and is a home to many palaces, temples and pavilions. Built in 1593 A.D. by Raja Rai Singh, this fortress is an immaculate example of Bikaner’s royalty. This red sandstone complex consists of many magnificent structures including Anup Mahal, Ganga Niwas, Badal Mahal, Hawa Mahal, Rang Mahal or palace of pleasure and Har Mandir, the royal temple. The royal museum inside the fortress has an array of rich royal collection consisting of unique weapons and an antique WW I biplane presented to the Maharaja by the British. Lalgarh Palace - Located just 3 km away from Bikaner, Lalgarh Palace is an immaculately designed and well embellished heritage property belonging to Bika Dynasty. Presently, a part of this property serves as a heritage hotel in partnership with Rajasthan Tourism Development Corporation. Old City Old city of Bikaner still preserves traces of havelis and beautiful Bhandasar & Sandeshwar temples, dating from the 15th century, adorned with colorful frescoes & intricate carvings. Famous among them are Rampuriya Haveli and Bhanwar Niwas Haveli. Deshnok - Karni Mata Temple at Deshnok is known temple in Bikaner, but for different reasons. The only temple in India where hundreds of holy rats form a center of devotion, Karni Mata Temple is another attraction associated with Bikaner. Feeding rats here with sweets is a devotional custom. By Air: Bikaner is connected via Jaipur, the capital of Rajasthan. By Road: There is frequent bus connectivity to Udaipur, Ajmer, Jaipur and Jodhpur. Besides this, road trip can also be opted during this journey. By Railways: Many trains connect Bikaner city to Delhi. 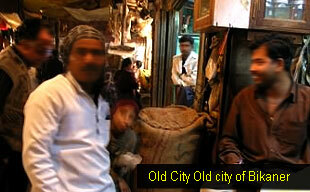 Climate - Swindling towards extremes, the climate of Bikaner is hot in summer months and cold in winter season. Jaipur - The city of victory, Jaipur is the capital of Rajasthan state. Filled with joyful contrasts, Jaipur heritage consists of impregnable forts, monuments and structures constructed by Royal Rajputs. The city royale has endless heritage belonging to the cultural tapestry of colours, traditions, richness and plush luxuries of life. Jodhpur - Amidst the heat of Thar Desert, Jodhpur enjoys the coolness and calm, all thanks to its blue painted walls and artistic frescoes. Once the capital of princely Marwar, Jodhpur now forms the part of Desert Triangle of the region. The royal past of Jodhpur can be revisited through Mehrangarh Fort, Jaswant Thada and Jain Temples at Osian. Jaisalmer - The golden hues of Jaisalmer add richness to the glory of this city. With a crowning legacy of forts, palaces, plush havelis and Jain temples, Jaisalmer is the heartland of Thar Desert where mighty mirages fill colours of royalty and legends in this city beautiful.